The column waxed predictably fulsome in its praise of God’s choice for Zimbabwe’s leadership. If one is to make a mutual consideration of the level of integrity, loyalty, honesty and transparency vested in our current President, Robert Mugabe, it is appropriate that his leadership qualities are related to his Christian upbringing … Even his current international stance on denouncing homosexuality is a clear indication that he is a God-fearing leader whose character and personality is modelled on biblical principles. Gasho always has information on his finger tips and is one guy who identifies with the truth. … Gasho will not keep quiet when he knows the truth. He searches for it too. From this I would infer that Gasho is an ambitious ZANU-PF apparatchik, and a local informer. His snitching in Karoi gave the excuse for a Presidential intervention and an investigation; the Herald seems now to be testing out his disputative talents on a national scale. Sources who attended a Select Committee meeting last week accused MDC-T’s Copac co-chairperson Mr Douglas Mwonzora and spokesperson Ms Jessie Majome of seeking to have gay rights included under the guise of minority rights. [MDC-T, Movement for Democratic Change – Tsvangirai, is the Prime Minster’s party; Copac is the Constitution Select Committee.] The sources said there was heated debate over the issue. “When they raised the issue, we asked them to define who should be covered by minority rights and they started mumbling and they said the Ndebeles and the Venda,” said a source. But this gives the game away. Mugabe’s real interest is in eliminating minority rights language altogether from the Constitution, and leaving only “individual rights” protections. He’s simply using gays as a classic wedge issue to discredit the whole discourse. And of course, he has reasons to want the Ndebele disempowered. Matabeleland is a longtime center of opposition to the regime. In the early 1980s, faced with mounting unrest there, Mugabe sent in his army’s North-Korean trained Fifth Brigade to massacre an estimated 7,000 Ndebele civilians. The Gukurahundi, as the killings are known in Shona, remains the great and devastating blight on Zimbabwe’s post-independence history. Mugabe has never acknowledged it. the push for gay rights is yet another renewed camouflaging tendency of the foreign aid regime used by the Western powers to create governance structures that are conducive for the exploitation and external control of weak African states. In the name of human rights Britain and its allies want to restore and consolidate what was once achieved through the strong political administration of colonialism. Note: The images above are by Owen Maseko, a Zimbabwean artist. 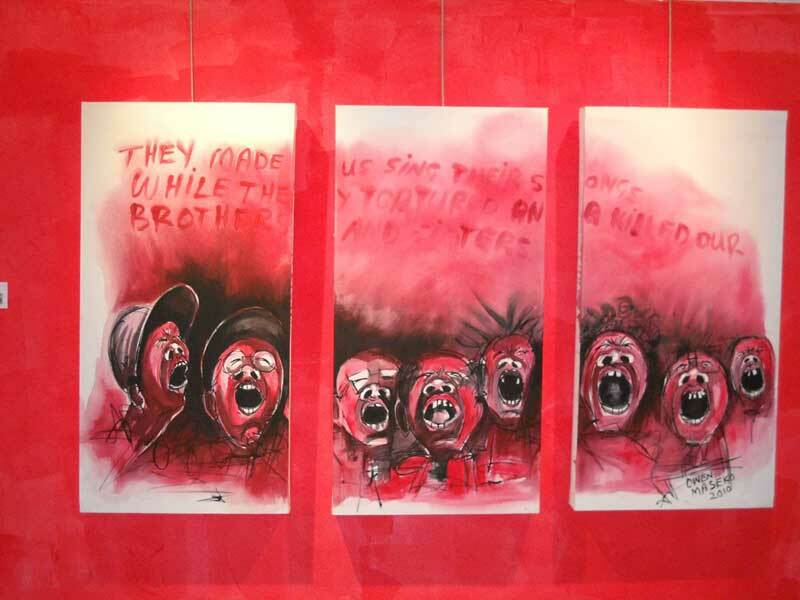 In early 2010 he opened an exhibition called “Sibathontisele” (“Let’s Drip On Them”) at Bulawayo’s National Gallery, with works focused on representations of the Gukurahundi. The next day he was arrested and charged with undermining President Mugabe’s authority under the Public Order and Security Act. He could face 20 years in prison. He is free on bail but the case is still pending. 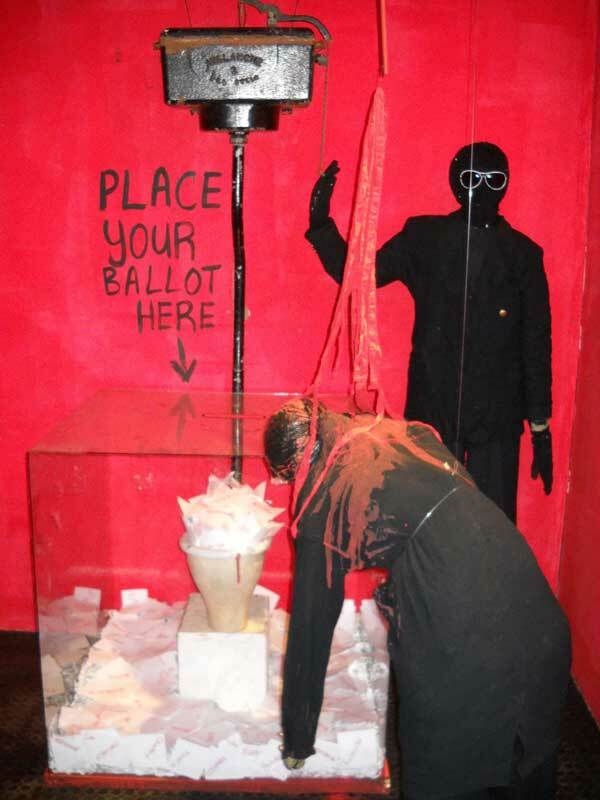 This entry was posted in Human Rights, LGBT Rights, Uncategorized and tagged David Cameron, Gukurahundi, homophobia, Matabeleland massacres, Mugabe, Owen Maseko, Tsvangirai, Zimbabwe by scottlong1980. Bookmark the permalink. Could be that what we need is for foreign goverments such Britain to promote human rights in Africa by supporting opposition leaders and investing in them more than they invest in ruling party oppressive governments. This could be one way of promoting progressive movements across Africa.